The Jacques Rivette Collection box set from Arrow arrives at last for US viewers, minus the 13-hour mega-film Out 1 and the 4 1/2-hour recut, Out 1: Spectre that UK viewers got in their set, since Carlotta Films already put out a stand-alone version of Out 1 in the US last year. Bargain hunters may gripe, but, in terms of effective curating, I'm glad we got the three films which make up the US Jacques Rivette Collection as a separate release. Around 1976, Rivette got a notion to speed up his productivity and decided to shoot four films back-to-back which would form a stylistically diverse but thematically linked cycle, tentatively titled Scenes from a Parallel Life. Music would play an increasing role, with the first film featuring no music and the final film being a full-blown musical, with production numbers and everything. Rivette shot Films 2 and 3, before having a physical and nervous breakdown on the set of Film 1 a few days into shooting. (Film 1 was eventually revived and fully produced in 2003, as The Story of Marie and Julien, while certain story concepts from Film 4 were cannibalized for Rivette's 2001 non-musical Va Savoir.) In 1978, Rivette was convinced by his producer to make a film that could be marketed as the "conclusion" of the abandoned Parallel Life cycle. Five years later, a tenuously related "final film" was released. It is these three films -- the two parts of the would-be series and a misbegotten coda -- that make up the US version of The Jacques Rivette Collection. The set kicks off with 1976's Duelle (une quarantaine) ( ), an unexpected hybrid of a noir detective story and mythological fantasy. Two mystery women (Juliet Berto and Bulle Ogier) are on the trail of an elusive everyman (Jean Babilée). Berto enlists the help of Babilée's sister (Hermine Karagheuz) as an amateur detective, while Ogier tries to get information out of Babilée's sometime lover (Nicole Garcia). It turns out that Babilée is in possession of a special diamond that's worth a lot more than money. You see, Berto and Ogier are actually goddesses allowed to walk the Earth for a 40-day period before they must return to their realm. The diamond would not only allow its possessor to stay on Earth, but to rule it as well. The film noir trappings allow Rivette to explore his pet fascinations, namely the existence of murky conspiracies lurking in plain sight (waiting for an amateur detective to uncover them, or not) and the craft of acting as a way of life. Every interaction in Duelle is a performance, both in the sense of the characters hiding their true attitudes and in the sense that the actors are self-consciously evoking a bygone style of film acting. In one of the interviews that accompanies this box set, Rivette admits that he lost interest in addressing real life in a naturalistic way at this time. So his actors aren't natural. They speak and move in ways that suggest theater or dance; the final showdown scenes between the goddesses and Hermine Karagheuz are wordless pieces of evocative choreography. Rivette avoids too many close-ups and tends to frame his shots like a theatrical proscenium, allowing moments to play out with the actors' whole bodies visible on screen. As in a Mel Brooks movie, or a Dogme 95 flick, certain scenes are scored by improvised piano, with the pianist appearing on camera, sitting nonchalantly in the background of the shot. This sense of multiple ongoing layers of performance carries over to the next film in the set, Noroît (une vengeance) ( ), also 1976. Originally conceived as a western about vengeance, the film eventually morphed into a pirate adventure, patterned after the Jacobean Revenger's Tragedy. (Rivette peppers the film with title cards featuring Act and Scene number notations, but he and co-screenwriters Eduardo de Gregorio and Marilù Parolini seem to have taken major license in repurposing this old story for their needs.) 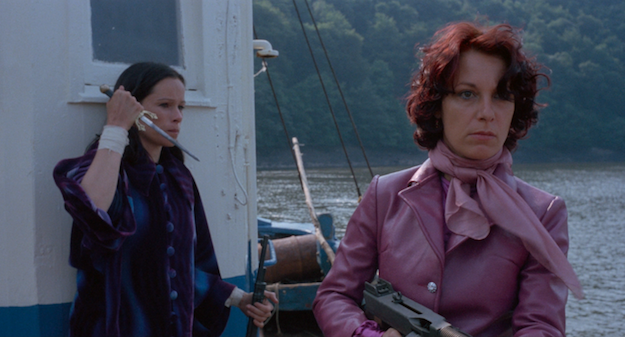 Geraldine Chaplin stars as Morag, a shipwrecked loner intent on avenging her brother, who died at the hands of Giulia (Bernadette Lafont) and her band of pirates. Morag is able to infiltrate the pirate clan, who are holed up in an ancient castle on a secluded island, by pretending to be a vicious mercenary. The hierarchy of power and shifting alliances within the pirates are never satisfyingly laid out, but Rivette evokes an ambience of unacknowledged paranoia (another pet fascination of the director). Morag does her best to kill off the pirates one by one, but many times, their greed and distrust lead them to their own undoings. Geraldine Chaplin is electrifying as the meticulous revenger, revealing Rivette's intelligence in casting women (here and in Duelle) in the kind of combative lead roles one would normally expect a man to fill. Morag's anger and her cruelty are symbiotically linked to her sensitivity and her wounded soul. Chaplin sinks her teeth into this tragic heroine who is not a 21st-Century Badass, but is also anything but a wilting flower. Many of the stylistic flourishes of Duelle are echoed and amplified in Noroît. The solitary pianist improvising with the actors here is replaced by a jazz-folk trio. This film also climaxes with a choreographed final duel that evokes modern dance choreography, although Rivette also cuts away to grainy black-and-white footage that repeats certain actions and disrupts the continuity (while anticipating the aesthetic of pretty much every music video ever made in the 1990s). Last up is Merry-Go-Round ( ), shot mostly in 1978 but released a full five years later. Joe Dallesandro and Maria Schneider are summoned to a hotel to meet Danièle Gégauff, who is Dallesandro's girlfriend and Schneider's sister. When Gégauff dodges them at the hotel, Dallesandro and Schneider are forced to team up to find out what's going on. It turns out to be another one of Rivette's vague conspiracies -- one that critic Jonathan Rosenbaum admits in a bonus-feature interview he doesn't fully understand -- that somehow involves the women's supposedly dead father and a stolen cache of 20 million francs. Although it is the least entertaining film in this set, by a mile, Merry-Go-Round is not completely terrible. It's mostly just jarringly inconsistent and too often lacks energy or discernible purpose. 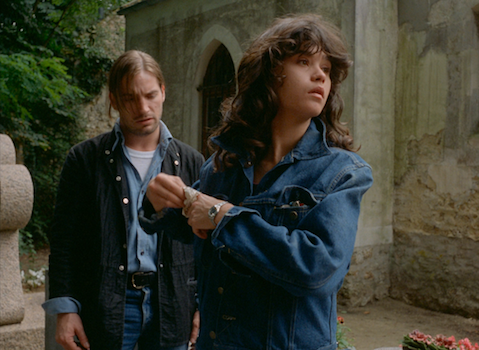 Rivette made the movie to finish off his original "Scenes of a Parallel Life" contract with producer Stéphane Tchalgadjieff, and to capitalize on the fact that Last Tango in Paris star Schneider seemed excited to make a movie with him and Dallesandro. They had no script, but they figured it would develop easily. Instead, the shoot became tumultuous, relationships became strained, and the emotional and narrative throughlines of the film suffered. In a supplemental interview, Rivette suggests maybe he should have thrown out the thin semblance of a story conceived during shooting and then made a self-conscious, Godard-ian collage of the material that was filmed. It might not have helped, but it probably wouldn't have hurt so much either. 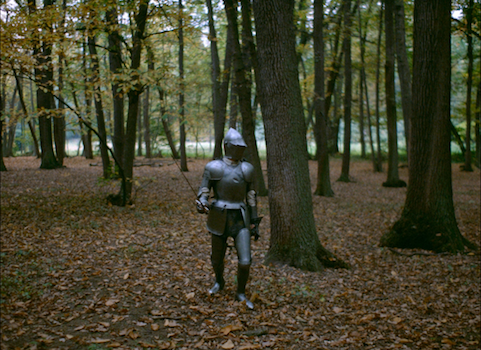 After all, the current cut is way too long and meandering at 160 minutes, and it already features a strange surreal thread where Dallesandro and Schneider's characters are shown chasing and fighting each other, while escaping from rabid dogs, snakes, and a knight on horseback. Making things even more puzzling, Schneider didn't show up for the filming of these scenes and Duelle's Hermine Karagheuz plays her role instead. The Jacques Rivette Collection is presented on 3 Blu-rays and 3 DVDs, containing the same material. A 58-page color booklet featuring credits, photos, new essays, and some reportage from the set of the first two films is included. All three films feature AVC-encoded 1080p transfers (the first two films are framed at 1.85:1, while Merry-Go-Round is Academy 1.37:1) that boast impressive color and clarity. The differences between the films are fairly subtle, but I would say that Duelle is relatively the least consistent, with fluctuating contrast and sharpness. Merry-Go-Round is the best, with outstanding consistency in color saturation, contrast, and sharpness. Noroît is pretty much right in between. Much like the video, the three LPCM mono audio tracks are all solid, but they get relatively better with each later film. (Duelle is French with optional English subtitles; the other two films feature a mix of French and English, with optional English subtitles only over the French dialogue [i.e., no English SDH].) Dialogue is mostly understandable, although Rivette's unusual approach to musical scoring sometimes leads to the dialogue getting somewhat buried or totally overpowered. There are moments in the first two films where the high end gets a little crispy, but the third film sounds cleaner and more balanced. Remembering Duelle (HD, 10:59) - Bulle Ogier and Hermine Karagheuz offer their memories of the film. Ogier talks about how Rivette essentially tricked Juliet Berto and herself into behaving like enemies in real life to get the performances he wanted. Karagheuz has a much more vague sense of what went on and often has trouble recalling the events of the finished film (couldn't someone have given her a DVD to watch before the interview?). Jonathan Rosenbaum on Jacques Rivette (HD, 22:25) - A new interview with critic Rosenbaum, who visited the sets of Duelle and Noroît. He talks a little about the troubled productions of the films, as well as the tepid reception they initially received. But mostly he seems to marvel at the way they piece together stylistic elements from earlier films, like the work of Jean Cocteau, into discomfiting new creations. Scenes from a Parallel Life: Jacques Rivette Remembers (51:43) - Two German interviews with Rivette, from 1990 and 2004, where he discusses his intentions for these three films, and the experience of making them. He still seems upset about Merry-Go-Round in 1990, describing how foolish it was to start filming without a script and without sticking to story chronology as they shot. He dismisses the finished film as a "work in progress." He seems a little more at peace and playful in 2004, if only because he has just completed The Story of Marie and Julien, which was originally intended as the first story in his 1976 four-film cycle. Like much of Jacques Rivette's work, the three films in this set have never received a proper home-video release in the US. While Merry-Go-Round is more of a historical curiosity with a fair share of bright spots, Duelle and Noroît are fascinating stylistic pastiches that merge theater, dance, music, and cinema in unexpected and sublime ways. The supplements are excellent, and Arrow delivers another attractive package that will look great on your shelf. All in all, this release comes Highly Recommended.